It was their unique style that made them different. The general public reaction was also very positive. Aura Lee Emsweller had sent a list of 11 questions for Joe Tarto to answer about his experience with as part of the Boswell Sisters’ recording ensemble. He very politely typed and returned the answers to those questions, which bozzies.org has the privilege of sharing below. 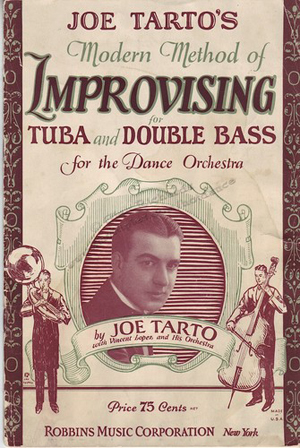 It tells the tale of how the “Titan of Tube,” Joe Tarto, got Bozzed! Q: When did you first hear the Boswell Sisters perform live? A: The first time I heard the Boswell Sisters sing was at the first recording date1 with them. They were terrific, different from the other groups. I enjoyed their style and harmony. Q: What was the reaction of the other musicians who performed on that recording? A: Other musicians shared my feeling of their style and harmony and thought they were great. It was their unique style that made them different. The general public reaction was also very positive. Q: How did you get to be a part of this studio group with the likes of Tommy and Jimmy Dorsey, Eddy Lang, Joe Venuti, Victor Young and with which other musicians had you recorded before the Boswell Sisters? A: Tom Rockwell organized the Brunswick Session and was responsible for getting the musicians. 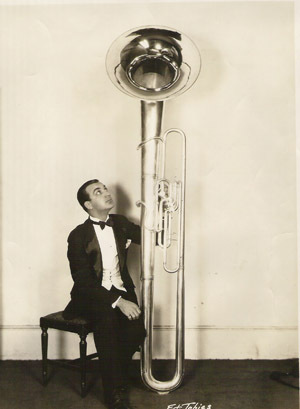 In addition to the musicians you mention, Manny Klein should also be mentioned because he made many of the numerous recordings with us before and with the Boswell Sisters. I personally had made recordings with far too numerous persons to write down, it would wound like the Joe Tarto story. However, just to mention a few, Cliff Edwards, Victor Young, Sam Lanin, Paul Specht, Vincent Lopez, Red Nichols, Dorsey groups, Miff Mole, Harry Reser, Nat Shilkret, etc., etc. My first recording date with Thomas Alva Edison. Q: What was it like recording with the Boswell Sisters? Did you realize you were making history with a groundbreaking group? A: All our dates were happy dates, we always enjoyed doing them. For the most part, we had to concentrate on what they were singing. They sang harmony and we had to play the backgrounds. I don’t think any of us realized we were making recording history, we just knew they were a good group and we did our best. I believe Connee outlined their work and we would listen to what they were doing and then we would play the background. Later, we had a few rehearsal sessions which were held at their apartment with just Joe Venuti, Eddie Lang and myself so that when we got to the recording session, we would have some idea of what we would play. During these rehearsal sessions, occasionally, I would go into the kitchen and make spaghetti and sauce. On some other dates other than Boswell, the musicians would be given the freedom to play (fake) what they felt, but most of the time we played written arrangements. Q: It must have been unique, in that day and age, to take direction from females. Was there resistance among any of the musicians? A: We weren’t taking direction from females (Boswells), so, of course, there wouldn’t have been any resistance or problems. But I doubt, had that been the case, there would have been any comments as everyone was a professional. As I said abve, the girls would sing the number through and then the second time they sang it, we would play along with them faking as we went along, run through the number two or three times, and we’d be all set. Q: Were there personality clashes among the musicians? Did it cause any problems when you were recording? A: The individual personalities of all the musicians was something that never really entered into our recording sessions. Every man was “strictly business” and worked at playing his best on the first and every session we had, often with the exception, perhaps, of Joe Venuti, who always brought extra joy and laughter during any idle moments we had. So, of course, there was never a problem of any kind with conflict of personalities due to the fact (I cannot stress enough) that the professionalism of the men was always first and foremost in their minds and hearts. Q: The stories of the Dorsey brother’s battles are legendary. How did that play out in the Boswell Sisters recordings? Did the fact that the Boswell Sisters got along so well help keep them on their best behavior? Did Tommy or Jimmy conduct any of the sessions? A: Neither Tommy nor Jimmy ever conducted. Yes, it’s true Tommy and Jimmy had many flare ups pertaining to individual ideas. We would get to a certain place in the number and one would have one idea and the other another idea and then they would argue and fuss about which idea was the better. Then the rest of us would step in and all decide which we liked best. I must say these flare ups never really caused us many problems because we knew one another so well, and we just took it in stride and kept going. I don’t feel that the fact that the Sisters got along so well had anything to do with the Brothers being on their best behavior when they were around. I think it was just a case of them putting their best foot forward when the girls were there. I might add that there was never ant untoward behavior or “passes” made at the girls by any of the men. Q: Connee talked in interviews about booze-fueled recording sessions late into the night, where the boys made loads of mistakes before finally waxing a good side. Connee’s description makes it sound like great fun. Was it? A: I strongly disagree with Connee’s remembrances of “The Boys” being juiced up and making many mistakes. Perhaps she’s confused “our” sessions with some of her own “solo” recordings which I didn’t do, as I recall.2 As a matter of fact, Eddy Lang, Joe Venuti, Manny Klein and myself didn’t even drink. Our beverages were coffee or soft drinks. Q: What made the Boswell Sisters so different? A: First, as I recall, the Boswell Sisters were the first trio of sisters to sing together.3 Their style and harmony was new and fresh and so very pleasant to the ear. Obviously the public felt the same way and the quickly became very popular. 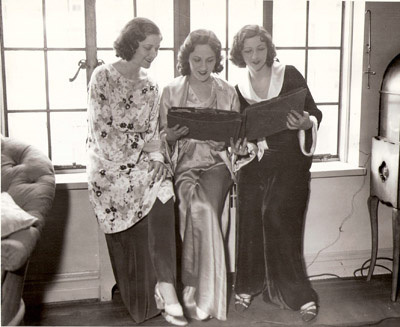 Q: Connee noted in interviews that the Boswell Sisters introduced a whole new style of trio singing that was completely different from what trios in the 20s had been doing. When you were creating this did it dawn on you that you were about to revolutionize popular music? A: Connee is absolutely correct when she says that trio singing in the 20s was different and they introduced a completely new style of harmony. We all knew we had a unique sound going and whole idea of voices and instruments together. But we had no idea it was going to revolutionize the popular music scene the way it did. To the best of my knowledge, we all were the first to be part of this type of popular music. Obviously if we could do it, others would pick up on it and follow our lead. And so they did, and still do. Q: Looking back, what has made the most lasting impression about making music with the Boswell Sisters? A: First thought that comes to mind is a great many happy moments. They were wonderful to work with. Always so pleasant, and I cherish all of these memories. As far as making music with the Boswell Sisters goes. As I have stated above, we truly did revolutionize the type of music we were all involved in. I more than enjoyed each and every one of our sessions and can only say it was my pleasure to have been part of them. Each and every date was a happy experience. 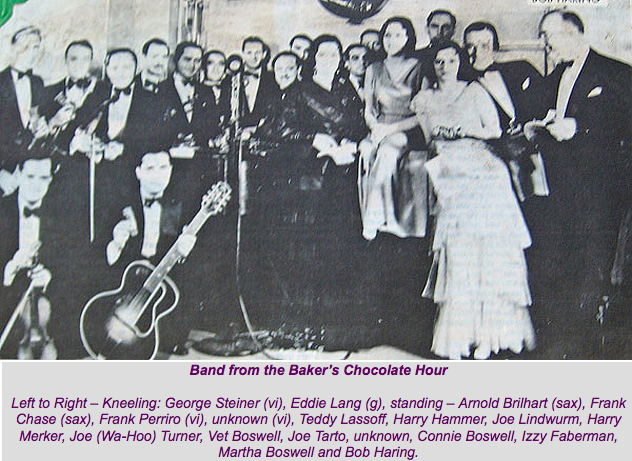 1 This was the first Brunswick session in New York City, March 19, 1931, where the recording of “When I Take My Sugar to Tea” and “Wha’Dja Do to Me” was made. 2 The Woodward-Hobson discography credits Tarto on four early Connie Boswell solos, including “I’m All Dressed up with a Broken Heart,” “What Is It,” “Time on My Hands,” and “Concentratin’ On You,” all recorded in 1931. 3 There were other female trios prior to the Boswell Sisters, including the Brox Sisters which Connie referenced in several interviews.